idk, my bff bxvi. dear god! | six words to change the world. ← tribute: to uncle kevin, yankee stadium. idk, my bff bxvi. dear god! This is not a joke. You, or should I write ‘U’, can now get texts from Pope Bennie 16 (which looks like an AIM screenname, don’t you think?)! 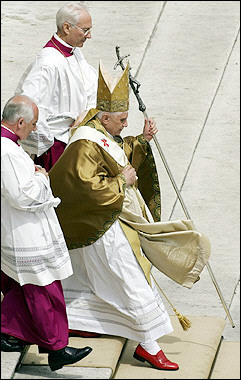 This is part of World Youth Day 2008, a huge Catholic festival for people that want to hang out, be cool and “get jiggy” with his mighty papalness. This year’s festival is in Australia- on the opening morning, “G’day Pilgrims!” scrolled across the welcome screen. Haha. How would you feel if you got a text from Benedict? There’s just something that doesn’t seem right about it. I think I would feel uncomfortable seeing it slammed in between drunk and/or inappropriate text messages from my heathen friends (LOVE YOU GUYS! And I’m just kidding, they are absolute saints). Plus, it definitely puts a whole new meaning to the idea that the Pope is a direct line to God. And the Pope has a direct line to your conscience via cell phone? I couldn’t stand all the Catholic guilt! Besides the obvious objections to getting text messages from the freaking pope, as someone who is way into copy editing and believes that you should be consistent in your writing, the first thing that struck me was that he didn’t abbreviate ‘people’ to ‘ppl’ and spelled out the word ‘you’ after using the letter ‘u’. On top of that, I am absolutely against text abbreviations. JP II would never have done this! JP, we miss you, buddy. So the Pope is trying to reach out to young people. That’s cool. I get it. Kind of. I always thought the church liked to kick it old school (as in, not evolve with the times), but maybe BXVI is a little too cool for school. Remember his shoes? Forget the devil, this Pope wears Prada. And sends texties.